Over at Mountain Beltway, Callan’s post about the Leesburg Conglomerate reminded me of one of my favorite building stones in Boston. It also happens to be the most common surface rock with good outcrops in Brookline, Roxbury and Jamaica Plain. That rock is the Roxbury Conglomerate, designated in 1983 as the State Rock of Massachusetts. Also known as puddingstone, the Roxbury consist of varicolored pebbles, cobbles, and boulders suspended in a fine grained matrix. In the field, the rock ranges in color between light blue-gray and dark gray. Water often stains the iron in many of the blocks to a red-orange color. This rock might be more properly called ‘church stone'; over 35 churches were built in the Boston area with Roxbury Conglomerate in the 19th century. 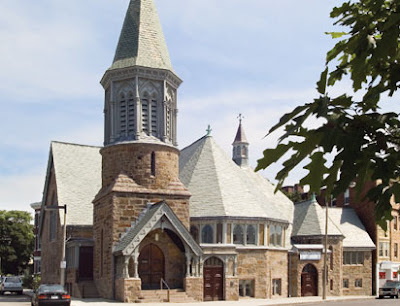 These include Christ Church in Brookline, First Church on Elm in Jamaica Plain, and St. James Episcopal Church in Roxbury. The Roxbury is to geologists what the dropped ‘R’ is to linguists, a sign that you are in Boston, for the puddingstone only occurs in and around the Hub. And like this linguistic trait, no one knows exactly where these rocks originated. It shares some affinities with rocks in west Africa. But it also shows traits of South American rocks. About the only thing that geologists agree on is that the Roxbury was deposited between 570 and 600 million years ago. 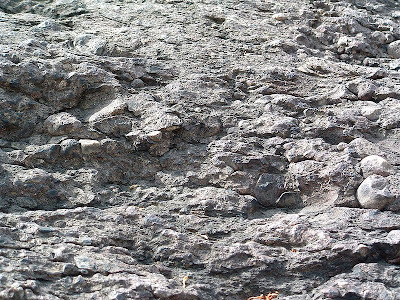 Like most sedimentary rocks, the Roxbury Conglomerate is the product of the breakdown of other rocks. Recent analysis indicates that it may have originated in a landscape that looked like modern-day Japan, with a range of volcanoes separated from the sea by a flat plain. Like all mountains, they were involved in a battle between uplift and erosion. And like all mountains, erosion won. Streams washed these eroded bits and pieces into a chaotic mix of sediments at the base of the mountains. In some places, gray to green lava flows abut the puddingstone, indicating that some of the volcanoes were active with molten rock flowing off their slopes. The Roxbury sits in the middle of a suite of rocks that includes granite found in Dedham and muddy slates that occur in Braintree. These rocks formed between 650 and 505 million years ago on, under, and in oceans bordering the drifting land mass known as Avalon. In its slow movement toward North America, Avalon may also have picked up a hitchhiker or two, which further complicates its history. Ongoing research, especially finding precise dates for all these rocks, continues to clarify details of the Avalonian picture. They tumbled on thick as rain. No matter what you want to call the stone, it is a nice looking rock and apparently a better stone to work with than the Leesburg Conglomerate. I'm guessing the difference in the suitability of Roxbury Conglomerate for building vs. the crumminess of the Leesburg Conglomerate has to do with metamorphism. Because of it's pre-Alleghanian age, the Roxbury was likely buried and subjected to more heat and pressure (fusing its grains) than the Leesburg, which is entirely post-orogenic and never buried especially deep. Your observation makes sense on why the Roxbury stone is so much better consolidated/cemented. I recognized the line about the Roxbury being to geologists what the dropped R is to linguists as soon as I read it. I have a copy of the article on Boston building stone that ran in the Boston Globe Sunday magazine years ago. Finally put it together! You are correct. I have used that line before. In fact, much of the text in my post was to go into a longer version of that article, which was cut by my editor.